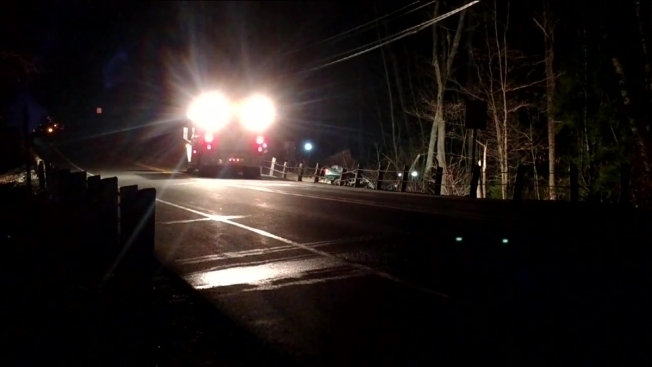 Three teens have been taken to the hospital after hitting several trees on Route 10 in Granby following a police pursuit that started in Southwick, Massachusetts. A Southwick officer tried to pull over the erratic driver of a 1999 Honda on Route 10 around 10 p.m., police said, but the driver refused to pull over and crossed the state line on Route 10 into Granby. The Southwick officer then lost sight of the car but came upon it when it crashed near Lakeside Drive at 10:46 p.m., police said. Granby firefighters pulled three teens, two girls and a boy, from the heavily damaged car and all three were all taken to nearby hospitals. Their injuries are not life-threatening. Route 10 was closed for several hours and reopened around 4 a.m. Tuesday morning. No police officers from Connecticut were involved in the crash, according to Granby police. The North Central Accident Reconstruction Team is investigating the crash.